At the opening day of the DigitalLife trade show held in New York, Microsoft made a number of Windows Media Center-related announcements, including new media extenders from its hardware partners Cisco, D-Link, Niveus and HP, as well as the Beta launch of a new Internet TV service called — wait for it — “Internet TV”. As of tomorrow morning, U.S. users of Windows Vista Home Premium edition and Windows Vista Ultimate edition will be able to download a software update, giving them access to a new feature inside Media Center: the beta release of “Internet TV”. 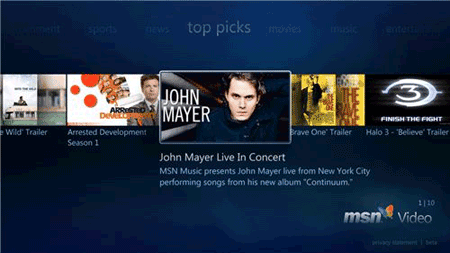 The new service will utilize Media Center’s full screen interface to deliver content from MSN Video, suitable for viewing on a PC or television. Since “Internet TV” is delivered through Vista’s Media Center software, content from the service will also be accessible from any networked “Extenders for Media Center” devices, including Microsoft’s XBox 360, as well as soon-to-be released products from companies such as Cisco and D-Link (see below). Content on “Internet TV” will be “free” to view, supported by advertising delivered by the Redwood City-based startup, YuMe Networks (see NewTeeVee’s coverage). Joined on stage by a number of its hardware partners, Microsoft also used the DigitalLife show to unveil specific products based on its recently announced “Extenders for Media Center” platform, all of which are expected to go on sale ready for the holiday season. The new media extenders are Microsoft’s latest attempt at solving the PC to TV problem, and are capable of streaming photos, music, video, live television — and now Internet TV — from a PC running Windows Vista Home Premium or Windows Vista Ultimate to a wide-screen TV. The two most notable features of Microsoft’s upgraded “extender” platform are DivX video support, and Wireless N capability; the latter is needed in order to stream HD content over a wireless network. Two “Extender for Media Center” devices were announced by Cisco’s Linksys devision. A version featuring an upscalable DVD player, the the DMA2200 priced at $350, and a sleeker model without the DVD drive, the DMA2100. D-Link’s DSM-750, priced at $350, which is similar to the higher-end Linksys model but instead of a DVD player, offers a USB 2.0 port for accessing external storage. However, where the DSM-750 appears to trump its many competitors is through giving users access to “ActiveTV Online”, an Internet TV service based on AMD’s Active-TV technology, that provides access to over 200 “channels” of on-demand video content, including free (e.g. ESPN, YouTube, AOL Video, Comedy Central, Veoh) and paid-for (CinemaNow, MovieLink). Hewlett-Packard also announced that it will be offering a software upgrade early next year for its MediaSmart line of high-definition TV sets that will expand their capabilities to match those of other “Extenders for Windows Media Center” devices. That $350 price tag for the Linksys DMA2200 doesn’t seem competitive with the Xbox 360, also $350, which can already be used as an “Extender for Media Center” device and can even stream HD content using a wireless-a router (such as the Linksys WRT55AG). @Bryan fair point. Although, one thing the new extenders have over the XBox 360 is that they claim to run a lot quieter. I don’t have a 360, but reports of how noisy they run, does put me off buying one as a media center. Good point: the 360 is pretty loud. My wife and I have it set up with an HDTV in our upstairs bedroom (our Media Center hub is my PC in our downstairs living room). The noise doesn’t interrupt our bedroom viewing experience because the 360 is drowned out by the program’s audio. Sometimes, when I’m downloading an HD movie from Xbox Live Video Marketplace and need to leave the 360 on overnight we notice the noise, but it doesn’t actually keep us awake. I do wish the 360 ran more quietly, but it wouldn’t be a significant enough factor to affect my future purchasing decisions. Sounds like things are getting better, but the industry still has a long way to go.